To get to the Hotel Nazionale in Venice you don’t have to climb brigdes with trolleys or heavy bags! The hotel is located near the railway station and it is easy to reach from the port, the bus station and the car park. The main landing point for water busses, the water bus station of “Ferrovia” is only a short walk away, from there you can begin your exploration of Venice and its lagoon in every directions. The large car park at the island of Tronchetto is connected to Venice by bus number 6/, by water bus line 2 and by a light railway called “people mover”. Piazzale Roma is the terminal for any mean of transport on wheels (busses, cars, motorbikes, bicycles). Here there are several multistore car parks. The port of Venice is the arriving point of cruiser liners, hydrofoils, yachts, ferries. It’s connected to Venice by bus, waterbus, and the “people mover”. People mover is a cable railway connecting Tronchetto to Piazzale Roma. It connects three important points of access to the city: Piazzale Roma, the maritime Station and the island of Tronchetto. At Piazzale Roma there is the bus Station, all busses and coaches connecting Venice to the mainland arrive there. Santa Lucia Railway Station is already embedded in the hart of Venice, once outside the station you immediately face the Grand Canal. 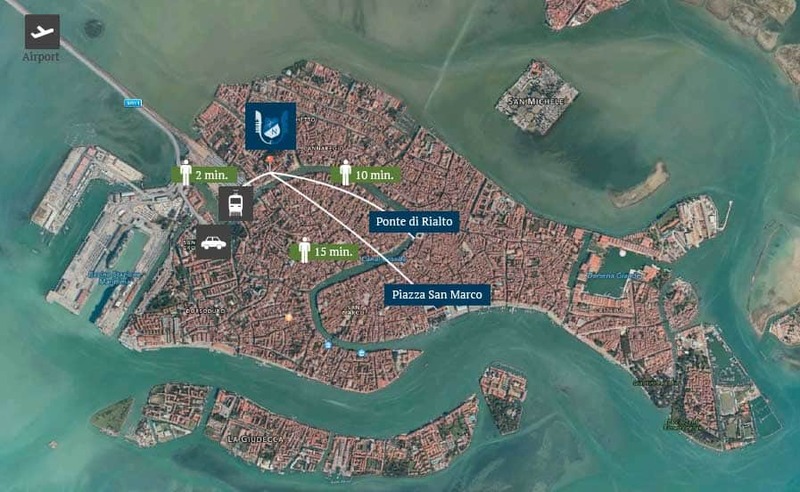 Ferrovia is the major stop for main waterbus lines, which take you to all locations such as Saint Mark, Accademia, Rialto and Murano.